When we talk about developing a story, we might be referring to several different aspects of our story. We might have in mind how we’re coming up with the plot, the characters, the theme, etc. Every author approaches the development of those elements differently. Some might plan out the plot events but wing the characters, others plan the backstory details and emotional arc for their characters but wing the plot, and so on. With both plot and character, if we’re looking for a middle ground between plotting and pantsing, we could start with the following basics defining Point A and B for each. Personally, I find pantsing my story’s plot easier than pantsing my story’s characters. As everyone’s brain is wired differently, others will have different experiences, but let me explain the difference I see between the two main types of development. When it comes to discovering our story’s plot as a pantser, to some extent, we can follow a cause-and-effect chain. One event leads to (causes) the next, so we could write a whole plot for a story simply by following the effects of the previous event. Write by the seat of your pants? Can we pants our character development or just our plot? Click To TweetPut another way, if we have ideas for the start of our story—and we have an intuitive understanding of story structure—we could end up with a coherently plotted story by instinct alone. My instincts naturally lead me through that cause-and-effect chain, complete with turning points and rising stakes. Pantsers without that intuitive understanding might need to plan a bit more. In other words, both pantsers and plotters use story structure to develop their plots. Plotters figure out their story structure consciously or “off the page” before starting, while pantsers’ instincts might allow them to figure out their story structure subconsciously or “on the page” during drafting. Conscious vs. subconscious—it’s just a different process of figuring out the structure of our story. A different way of working out the details. On the other hand, the cause-and-effect chain won’t help us discover our characters as a pantser. If they’re struggling with their relationship with a parent, that situation exists even before we stumble into a big argument scene in the middle of our draft, and hints should have been woven into the story earlier. However, pantsing our characters’ development isn’t all bad, as it can also lead to more organic characters. They’re not acting or reacting in certain ways simply because the plot requires them to. Instead, their actions and reactions are purely driven by what we know about them, what’s come before, and what they want. My instincts help me—to some extent—through developing their character arc, but there’s more layers to characters than just the aspects connected to their growth. And whether we’re talking about arc details or other layers, pantsers might figure out who their characters are only during the discovery process of drafting. 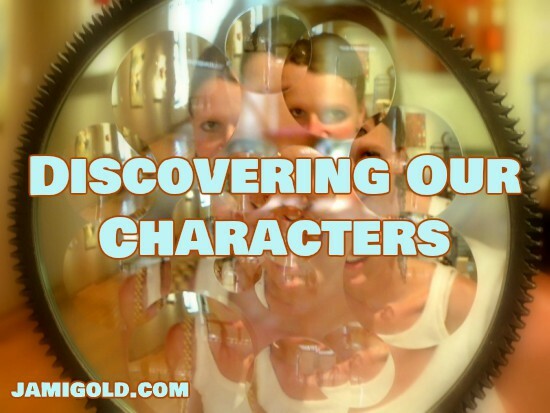 What Does It Mean to Discover Characters? For pantsers, the first draft is often a “discovery” draft—a draft that allows writers to discover the story bubbling in their subconscious. Pantsers might have vague ideas about a character’s longings, goals, or flaws, but many times the details—and sometimes very important, story-defining details—aren’t known until we put the words to screen. In my novel Pure Sacrifice, the second scene reveals the hero is a prince. Even though that detail drives much of the plot (and his false belief) as he struggles to determine his place among his kind, I did not know that detail before I typed it. Typing the words was the act of discovery. In my novel Stone-Cold Heart, I didn’t discover that the hero had come into power in a roundabout way that left his abilities restricted until I was two-thirds of the way through drafting. In that case, hints had been piling up earlier, but I hadn’t consciously realized what they meant. Putting those pieces together—much as a reader might—was the act of discovery. In my novel Treasured Claim, my heroine’s voice was strong in my mind from the beginning. Essentially, she told me who she was from page one. Listening to her voice and following her lead was the act of discovery. How Does Discovery Affect Our Drafting Process? You might be asking now—what was the story of Pure Sacrifice going to be if my fingers hadn’t typed that revelation about the hero being a prince? In my case, for my pantsing process, the answer is: Nothing. For all of my books—but especially with those two stories with the bigger “revelations”—discovery required me to trust my subconscious while drafting. With Pure Sacrifice, I had to trust that—when prompted to type such a story-defining detail—my subconscious had a plan. With Stone-Cold Heart, I had to trust my subconscious had a plan for all those earlier hints and not edit them out as being unnecessary to the story I thought I was telling. What Does It Take to Pants a Character’s Development? Every pantser might have a different answer. For me, my answer would slightly change from story to story and character to character. In general, I suspect pantsers are more likely to follow characters’ lead for that organic development than attempt to keep their characters “in line.” As I replied to Dean, if I’ve been following the lead of my subconscious, my story usually just needs tweaks during revisions, and I don’t have to make major changes. For my novel Ironclad Devotion, I didn’t need to make any tweaks for my hero’s backstory wounds with each of his parents, even though I didn’t know what the early hints were leading toward until much later. Sometimes, it all just fits. How can we write a story if we don't know our characters well yet? Click To TweetHaving everything click right from first draft is usually the exception and not the rule, however, and that ability to see what needs to be changed for consistency’s sake is a skill all its own. For Stone-Cold Heart, I had to go back and tweak my hero’s thoughts through the whole story to match how that backstory detail of how he came to power would affect his false belief. In other words, it’s possible to be a pantser through the process of character development, but it’s certainly not easy or right for everyone. Where do you fall on the plotter-pantser spectrum? How much do you develop your characters before writing? Have you ever used pantsing to discover and develop a character? Did you struggle or did the pantsing process work for you? Do you have any other insights or suggestions about pantsing a character’s development? Haven’t replied in a while. Doesn’t mean I stopped reading your posts. “even pantsers can struggle with pantsing” … BRAHHHH!!! BRAHHH!!!! So…about that stand-up career move. When will I see you in Vegas? LOL! Do I sense a struggle there, Donovan? 😉 Glad I could entertain, and thank you for the laugh as well! How many pantsers does it take to screw in a light bulb? If a pantser can’t pantser, what do they do? If a plotter can’t plot, what do they do? Put on pants. Stop writing nakid! If a plotter can’t plot, and a pantser can’t pantsers (with or without pants), how many pancakes does it take to fill up a dog house? *record scratch* 3? Are you sure??? LOL! As you say the subconscious tends to provide what we need. If the character does something that doesn’t feel right, or more usually with me, the character is described offhandedly as doing something when we really should give it more weight and see them actually do it, the subconscious will prod for the better version to be written. Yes, we might get inklings at first and then have to flesh those vague ideas out, or as you said, add more weight or meaning to the detail. Often I would wish that my character would do X, but if they won’t, then that’s too bad for me. They can’t be forced. Just like love can’t be forced. I love those moments when elements of the story click together and suddenly you understand why! I get a general impression of my characters as soon as the story idea formulates. Sort of like you get a first impression of someone you’ve just met. From there I get to know them from how they react to whatever is happening in the story. This is where some of us moan about our characters going independent on us. I often don’t know what they’re going to do until they do it. I still remember one tearful moment, literally, tears sliding down my face, while I was writing Dance of the Goblins and a character I was fond of plunged into a situation that would surely get him killed. I mentally begged him not to do it, but he was young and impulsive, and in love with the girl. It was a traumatic session for me. I consider myself a pantster. What’s weird is I know my characters going in rather well, though I’ve had some surprises along the way. I think what I look at is knowing who they are, and then seeing how the story changes them along the way. An example are two characters, both cops. Her name is Pam Harmon, blonde, good looking, a good Mormon girl. He’s RJ Madril, most definitely Hispanic, but handsome and a good Catholic. There’s always a lot of attraction between the two of them, they’re very good friends, but they dance around their differences. Are they going to be enough to keep them apart or will events bring them closer together?